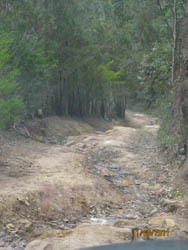 This is a liesurely dirt road deviation from the Bells Line of Road. Could probably do most of it in a 2WD in fine weather, apart from one section where a bit of ground clearance is needed. Turn right off the Bells Line of Road onto Mt. Irvine Road. It is easy to miss as the sign post isn\'t too distinct. If coming from Sydney way, start to look out for the turnoff after you pass Mt. Tootie Rd turnoff. There is a sign at the start saying Road Closed, but this has been there for years, and the gate is open anyway. On the descent, there are a few puddles and the road is a little bit rocky. You descend down two hairpin bends before reaching an old wooden bridge across Bowen\'s Creek. The views on the way down are great. There is a great little campsite on the other side of the bridge down by the creek. There is a sign here saying 4WD only beyond this point, but i think this is meant to be facing the otyher way, as the climb out is simply a smooth dirt road, with the occaisonal rocky section. Did this after a week of heavy rain and needed to use 4x4 on the slippery climb out. Up the top there seems to be a few narrower dirt roads heading off form the main road, these may involve a bit more 4x4 action, but i have never been out along them. Well worth a visit if you are up in the area. Once at Mt.Irvine, you can either drive back the same way or continue along the winding sealed road back to the highway via Mt. Wilson.